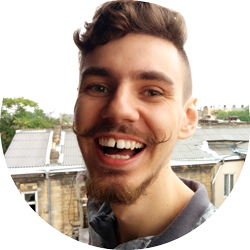 My name is Stas Parshin and I’m passionate about productivity, simple life and apps that make our daily tasks easier. Since 2007, I run an online lingerie store based in Ukraine and I would like to share my experience with fellow small business owners. I have a background in Economics and 7 years of entrepreneurial struggle in a highly unstable environment. In 2013 I was invited to talk at Yandex conference about our email marketing success strategies. My presentation focused on building customer loyalty with triggered email series and was backed by the fact that email newsletter accounted for nearly 30% of our store revenue. I went through pains of working with a big name agency that after more than a year of talks, drafts, and uneducated decisions dropped our Magento project that meant to substitute our outdated shop CMS. After some (lots of, actually) thinking and comparing I decided to move to SAAS environment. Almost within a month I developed and moved to a brand new Shopify store. All by myself. So I’m going share with you what I had to change in my working environment and which preconceptions I had to drop in order to start moving quickly and get results I never saw before. I will post some tutorials on how to set up a shop by yourself, how to market your store, work efficiently and which tools you have at your disposal. No fluff, just solid advice in plain English (cause that’s the only English I know) on things I’ve learned and tried by myself.